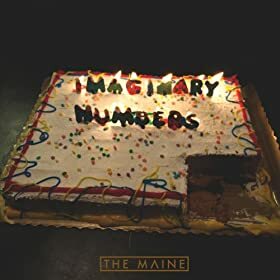 There are hundreds of sentiments that we could convey about The Maine’s acoustic EP Imaginary Numbers. We could tell you that this is a mellow version of The Maine we have never seen before. We could tell you that this EP broke our hearts. We could tell you that this release made us feel something we didn’t even realize we had pushed deep down into a darker corner of ourselves until it had pulled it up into the light. We could tell you that though we thought it to be impossible for the Arizonian quintet to continue growing, they managed to prove us wrong and give us an even more mature evolution of themselves. The only thing is, those sentiments don't even begin to cover it. Never before had an album left us with an uncertainty of what to say. It wasn’t until much later - we’re talking an embarrassing amount of listens later - that we realized what exactly it was that this EP had done to us: it had literally left us at a loss for words. What this release made us feel was difficult to convey on a page. The second effort of 2013 from The Maine is like an auditory diary. From the opening track ‘Lovely Sad’ through to the ending ‘Visions,’ fans will find themselves as both spectator and key player while the band leads them through their deepest inner most thoughts to lead listeners to those thoughts of their own. It creates questions and answers, exemplifying heartbreak, loneliness and the fact that being alone doesn’t necessarily have to be a bad thing. “For now I am alone. I think I like being alone,” singer John O’Callaghan croons to close out ‘Raining In Paris,’ and while there is nothing special about the wording, it is the line in all of Imaginary Numbers that listeners should latch onto. More often than not, solitude is depicted as something to avoid, as something sad, but The Maine offers a new view. It is okay to be alone and, for what it’s worth, you aren’t alone in loneliness. To be frank, there aren’t any standout tracks on Imaginary Numbers. All five tracks are equal in their brilliance, and the release wouldn’t be the same with any more or any less than those five. It is a 24-minute experience that not only demands to be listened to, but demands to be felt. To be able to adequately review this release would be to adequately sum up the emotions that every listener will inevitably feel whilst listening to it, which is an impossible task. There is only one way to understand the experience, and that is to experience it for oneself. All we can honestly offer, is that this is an EP you do not want to miss. Imaginary Numbers is out now via 8123.